Up to 3500mm x 1250mm x 5mm sheet capacity in mild steel. We use a Trumpf CNC automated punching centre to process a wide range of sheet metal components. Sheet metal components are designed with the use of a computer and a program is produced to manufacture components out of standard sheets without the need for pre-cutting blanks. Complex precision sheet metal parts can be accurately produced in quantities from one-off prototypes to high volume production. Pierce-all punching machines are commonly used to accurately punch holes, profiles and notches in a wide range of materials and/or components. It is a more accurate and cost effective method when compared to marking-out, drilling, sawing and filing etc. Our machine is capable of punching a 50mm diameter hole in 6mm thick plate. Up to 3100mm. These machines are used to accurately bend sheet metal components. 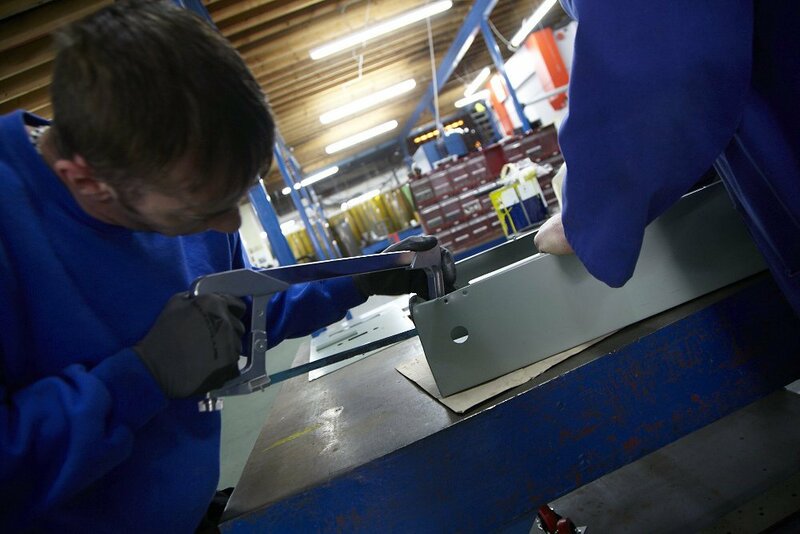 A wide range of components can be produced from simple trays to complex parts that incorporate a number of bends, joggles and radii to produce the required shape. We fit a wide range of threaded studs, bushes and specialist fastenings into sheet metal components. A reliable and consistent welding process that is suitable for small quantity and mass production. When the welder presses his trigger the arc is struck automatically through the welding wire, which is fed into the weld at a pre-determined rate. A shielding gas is also introduced into the weld area in order to promote a clean weld with little or no oxidization. This process allows a wide range of metals to be accurately welded. Aluminum and stainless steel are the most common materials we weld using this process. The arc is produced with a tungsten electrode that is surrounded by a porcelain shield where the shielding gas is introduced in much the same way as in MIG welding above. We use these processes for joining components made from dissimilar metals. For example copper or brass earth fixings can be reliably attached to enclosures ensuring high conductivity or earth continuity. Up to 10mm stud diameter. This process is commonly used to weld threaded studs onto sheet metal components, although a wide range of fixings are available that can be attached using this method. Up to 3mm + 3mm. Used to produce welded joints where a lap type joint can be used. It is common to fix piano hinges to sheet metal doors using this method. It is also common for automotive parts to be joined in this way. Box oven up to 350 degrees Fahrenheit, 2000mm x 1500mm x 1500mm. Wet paint is applied to the product using a spray gun. Stoving enamel has to be stoved at high temperatures in an oven. The advantages are that it is a more robust finish as compared to air-drying paint. Work envelope is 1200mm high x 800mm wide x 1000mm long. The component to be painted is suspended on a conveyer that transports it around the process. The component is taken through the first pre-treatment stage, which cleans, degreases and phosphates. It then goes though a second identical stage, which ensures the cleaning and phosphate quality. It then passes though a cold water rinse and a final hot passivity stage. Once pre-treatment is completed the product is passed though a drying oven because it is vital to ensure items are perfectly dry prior to powder coating. Powder paint has a similar consistency to talcum powder and is blown on the product using either a manual or automatic gun. The gun puts an electro-static charge into the powder, which is then attracted to the product. After the powder is applied it is fused to the product in a curing oven. The main advantages of powder coating are that it can be more robust as compared to stove enameling, and it lends itself very well to cost-effective volume production. 200 liter capacity. Commonly referred to as rumbling this process can be used to debar or polish metal components. The products are placed into the machine along with abrasive chips. A detergent is mixed with water and circulated though the abrasive chips as the vibrating action brings them into contact with the product to be polished. Used to quickly and accurately saw stock aluminum and extruded aluminum to length.